I was born in Jakarta, Indonesia in the late 80’s. Now I work as journal administrators for visualjalanan.org. The journal was initiated by Forum Lenteng (http://forumlenteng.org) to record visual activity that occurs on the streets. I also make comics (http://instagram.com/komikpinter), a comic about daily jokes that may not suitable for kids. In 2013, komikpinter awarded “Most Slimy Comics” at FKF held by Daging Tumbuh as a parallel event of the Biennale Jogja XII – Equator #2. Also In 2013, with my colleague in Visual Jalanan, I initiated Klub Karya Bulu Tangkis (http://instagram.com/klubkarya). a space for experimentations and explorations of technology, visual, cultural, and urban youth. 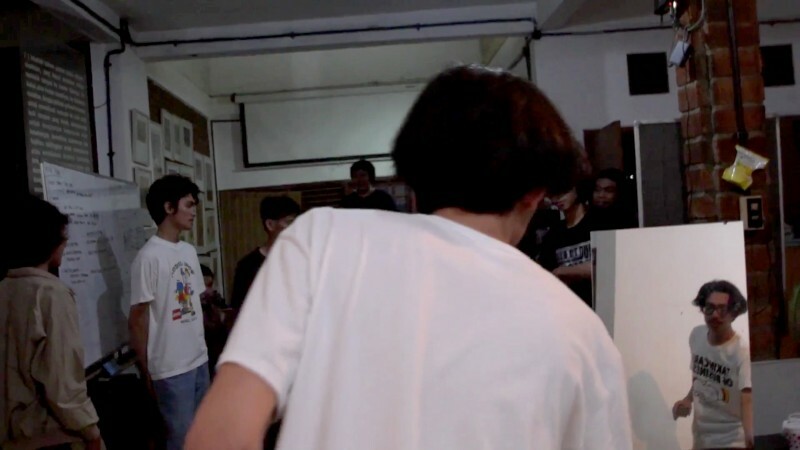 I also forms Kasetan, a disc jockey duo that uses cassette tapes as the main medium. In 2015, I was a co-curator for ‘Cinema Civilization in Exhibition #2 – Moving Image Colony: Between Fact and Fiction’, during the ‘ARKIPEL Grand Illusion: the International Documentary & Experimental Film Festival’. Also a one of the curator for ‘Visual Jalanan: Bebas Tapi Sopan’ in the National Gallery of Indonesia as fringe event of Jakarta Biennale 2015. In early 2016, I was one of the founding member of 69 Performance Club (http://69performance.club), we doing activities such as conducting workshops, monthly performance, discussion and research on the development of performance arts in Indonesia. In my recent works, I often used internet and gadgets as part of my artistic practice. I am interested in relationship between human and the thing they create. I am also interested in socio-political issues, development of mass media, and historical events. There is no limit in medium for my artistic practice. It could be drawing, audio, video, interactive installation, or performance, and since my artistic practice are kinda spontaneous, I love to experiment with new thing, I love to play and create or modify objects like some analog devices like TV, audio speaker, overhead projector, music instrument, etc.